Steve and I had the privilege to talk with Kendra and Lori at the CREATE Festival in Pittsburgh, USA, where they performed a short version of Intersection*ology. The title "Intersection*ology” combines “intersection” with “technology”. 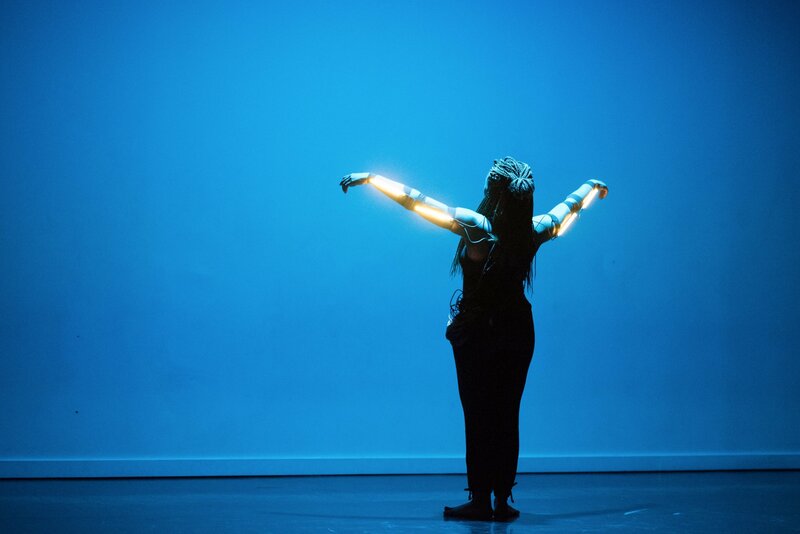 Technology is, of course, ubiquitous in the piece, and is mixed with the human element, with womanhood. 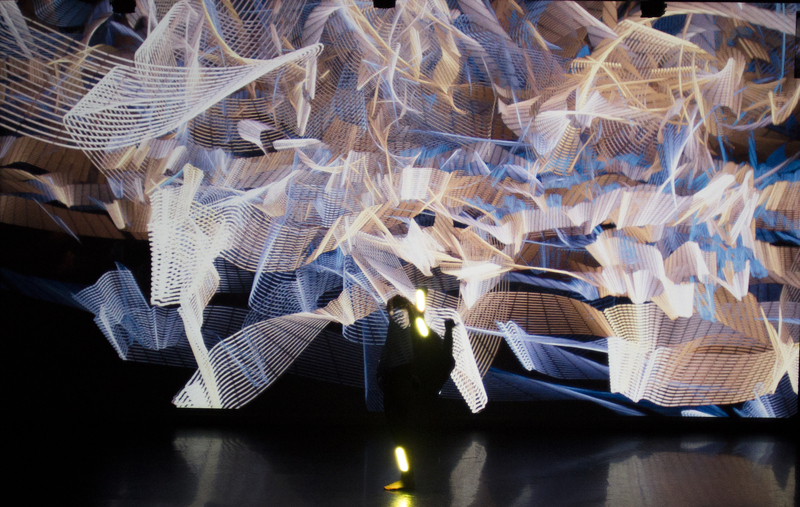 Lori and Kendra wear LEDs on their bodies, and their movements make light-paintings on the projection. On top of soundscapes Kendra has made in Garage Band, she layers live improvised vocals. “I live my life sort of thinking about technology as a tool but also as a part of my identity,” said Lori. 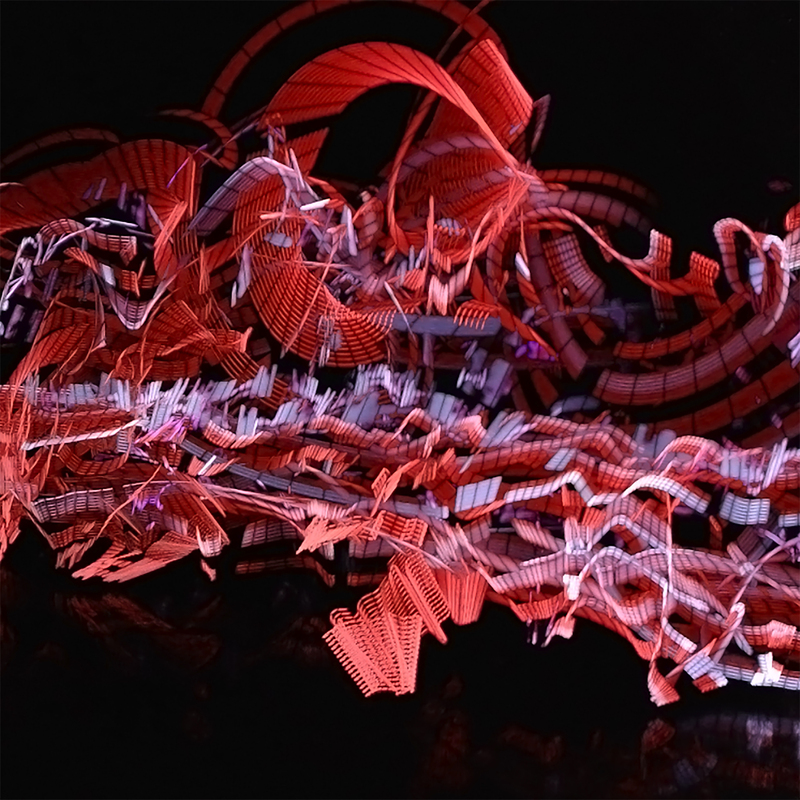 The idea of light-painting with wearable LEDs grew out of some of Lori’s previous work, including abstract photographs of tweets. “There’s a webcam facing the stage and it’s basically seeing what we’re doing with the LEDs… seeing the movement and capturing it and kind of making it stop, and so then we can keep all the trails.” Vuo is the “finishing piece of what made the piece actually work.” It processes the images from the webcam to make different kinds of trails and “words that come up through our movements.” The processed video is projected back onto the stage in real time. Lori and Kendra met at a workshop for artists in Pittsburgh and continued getting together monthly with a group of local artists. 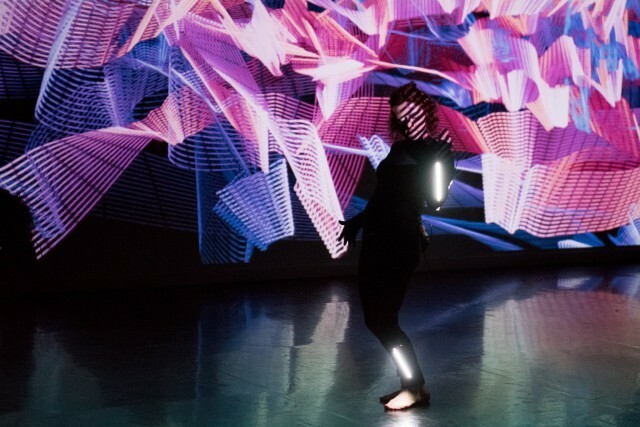 When they heard about a residency program at the Kelly Strayhorn Theater, which was looking for artists who hadn’t collaborated before and would incorporate new media technology into their work, they applied together and got the residency. 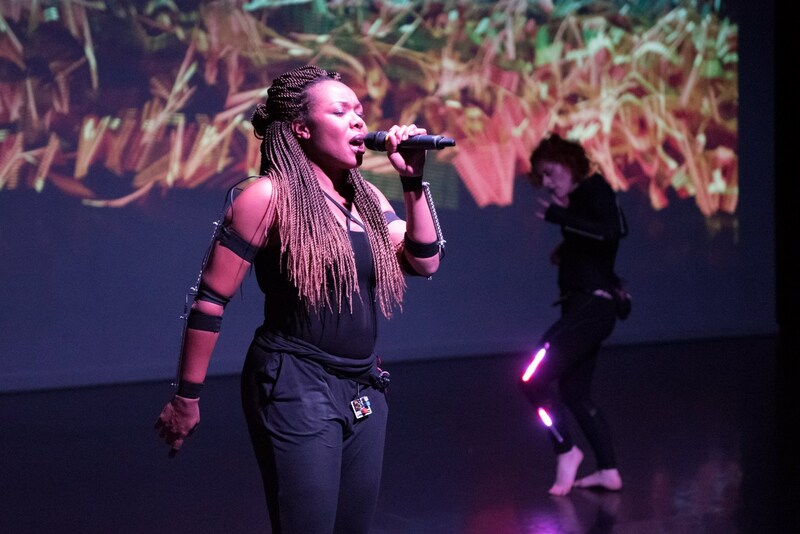 Kendra and Lori’s residency culminated in March with a performance of Intersection*ology at the Kelly Strayhorn Theater. In addition to developing Intersection*ology, Kendra and Lori both have plenty of other projects. Kendra is working on an album, pursuing a doctoral degree in community engagement, and working full-time in music business. Lori, in addition to her art and teaching, is starting the River Route Residency, a series of outdoor retreats for artists and art supporters. Concept and images are outstanding. Thank you for sharing.